These classes allow the senior students from the Peterborough clubs to train together on a weekly basis. Classes are geared specifically to the senior kyu syllabus. Out of town visitors are welcome on a drop-in basis. Join us on Facebook for up to date notices and information. Andy Dobie began his study of jiu jitsu in 1985 at Plymouth Polytechnic in Plymouth, England, with the National Samurai Jiu Jitsu Association (later renamed The Jitsu Foundation). In 1988 he became the club instructor of the University of Plymouth Samurai Jiu Jitsu Club, a position he held until 1992. In August 1993 he moved to Peterborough, Ontario, Canada and established the first Jitsu Canada club, at Trent University, then later opened the Peterborough YMCA club in September 1998. 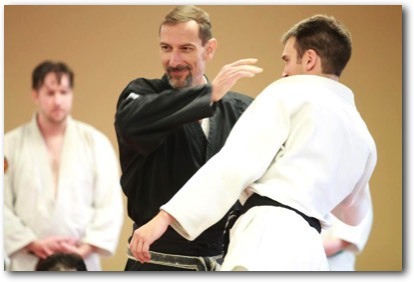 In addition to jiu jitsu, Andy also studies iaido through the Canadian Kendo Federation. Andy is the president and head instructor of Jitsu Canada.